It certainly did not go unnoticed that these arrangements totally bypassed Russian and Tajik offers and seem designed to undermine the SCO by skirting recognition of the bloc in favor of nation-to-nation deals. This backdrop of a quiet American military presence in the former Soviet Space held for the next three years as the revolutions unfolded in Georgia and Ukraine and resentments grew sharper. 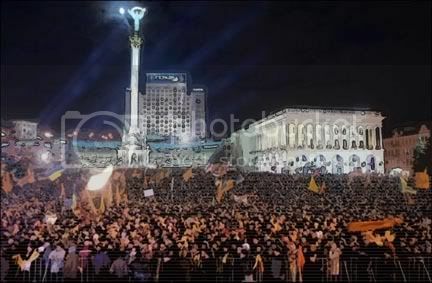 The next move in America’s campaign came soon after Ukraine – perhaps too soon and too far east. In Kyrgyzstan, the US basing agreement was followed by an attempt – if tentative - at a Ukraine-style revolution there, a bold stab into a stronghold of loyalty to mother Russia. The local Russian population holds great sway in the capital, and in May 2000 Russian was declared an official state language, given equal in status with Kyrgyz. Bishkek is also home to a Kyrgyz-Russian Slavic University, which trains political elites in the Russian tongue and is financed by the Russian government. Bishkek and the north, closer to Russia in more ways than one, ruled the scene as it had under the old Soviet system. Askar Akayev, while born in the South (Jalal-Abad), rose to leadership among the Soviet-era elite. A mathematician and physicist by education who wrote his doctoral thesis on holographic systems of information storage, he was appointed in 1990 to the new post of President of the more autonomous republic. Akayev held his position in Bishkek after independence and for over a decade past that. In a country racked by mafia crime and corruption, the president earned a reputation as a crusader against the opium smuggling criminal networks. Yet the situation has remained chaotic and unstable; Bishkek has seen more than its share of mafia-connected political assassinations, and the voters had had more than enough. But it was Russia that really rushed in to bolster Eurasian power. At the same time as the exercise with China, Moscow’s Anti-Terrorism Center decided to open in Bishkek its first regional division outside of Russia. Putin announced the idea of the Bishkek branch as “countering the threats from the south” - Islamist militants and opium flowing from American-occupied Afghanistan. This was followed in November  and December  2002 by joint Kyrgyz-Russian announcements on the dangers of terrorism and the importance of unity against it. Two days after Christmas, an explosion at Bishkek’s main market killed seven people and injured scores. The very same day but a thousand miles away, a truck bomb detonated at the government’s headquarters in Chechnya, killing fifty and wounding hundreds. The immediate impression was of synchronized acts of terrorism aimed at Russia and its allies, and suspects linked to the Islamic Movement of Uzbekistan were later arrested, tried and convicted. But early reports had described a container of fireworks at the market going off, detonating a gas tank in a freak accident, an account still reported as fact in a few spots. Some western media outlets seem to buy the Kyrgyz version of events, and even tie the terrorists in to an alleged plot against America. But otherwise the western media remains vague or ignores the episode altogether. The BBC’s timeline simply calls it an explosion, and a State Dept. chronology of every Islamist terrorist attack includes the 12-27 blast in Chechnya, but not the one in Kyrgyzstan. Either way, the synchronicity of the blasts helped tie Russia and Kyrgyzstan together on the counter-terror front just two months after the decision was made to set up the Bishkek center to that very end. 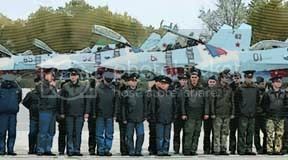 Russian military assembled at the Kant air base, Kyrgyzstan, in 2004. An agreement was reached in May 2004 by which soldiers at Kant would receive the same status as the diplomatic mission’s technical staff, making them effectively immune to criminal prosecution in Kyrgyzstan. Kyrgyz Foreign Minister Askar Aitmatov visited Moscow in mid-February 2005 and immediately announced two decisions; to send more Russian military equipment and weaponry to the Kant air base, and to deny the U.S. request to deploy AWACS reconnaissance planes at Ganci air base. Aitmatov said on the 14th that a decision was made that an AWACS deployment would not fit the mission of Ganci “which is to provide support to the operation in Afghanistan,” not to spy on Russia and other SCO signatories. So the government there seemed to have sided with the Russians, encouraging a slow growth of their capabilities there while curtailing or at least limiting the Americans’. “Askar Akayev.” Wikipedia. Last modified September 22 2006. “Twelve Military exercises: A chronology.” China Daily. August 19 2005. Saidazimova, Gulnoza. “Kyrgyzstan: Is Bishkek Moving Toward Russia Ahead of Elections?” RFE/RL via EurasiaNet. February 15 2005.